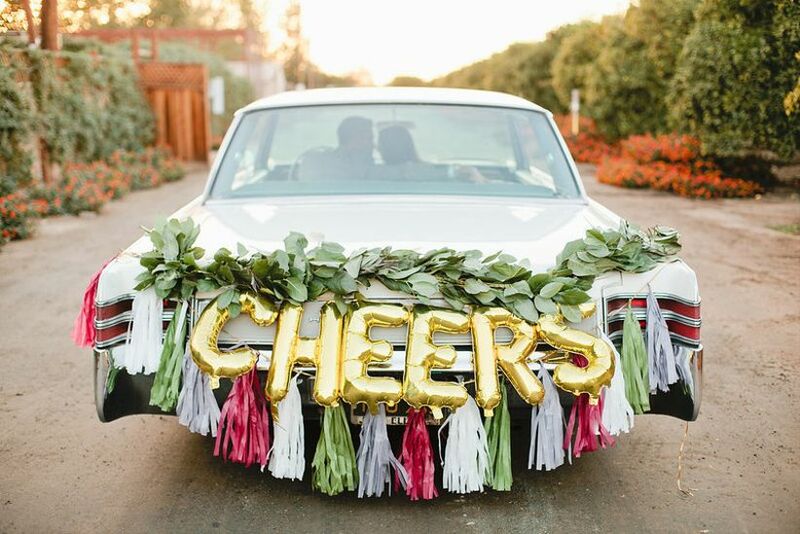 Drive off into the sunset as the happiest (and most stylish) couple with the help of these wedding car decoration ideas. Your first car ride as newlyweds is an exciting and priceless moment. 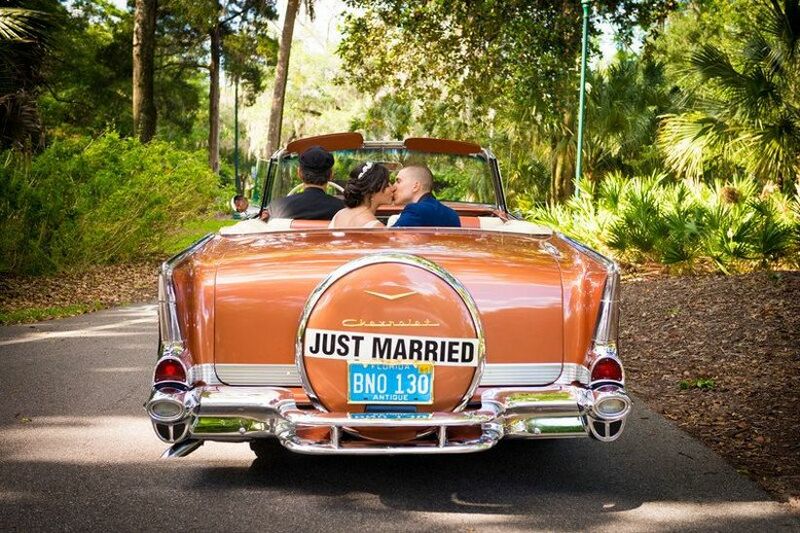 Decking out your set of wheels can help make the moment even more special, which is why we're sharing some of our favorite wedding car decoration ideas to spark your imagination. 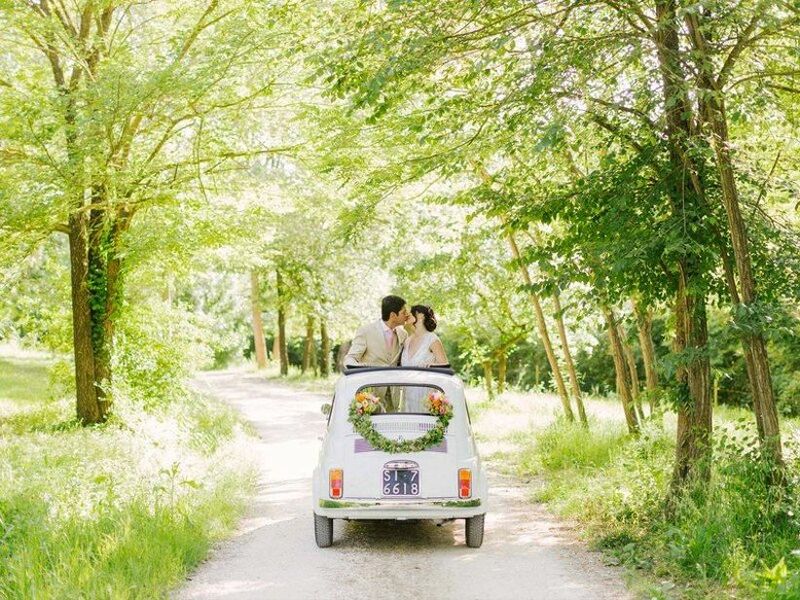 Whether it takes place after your ceremony on the way to your reception, or at the end of the night as you bid your guests adieu and make your grand exit, the car ride is likely to be one of the first (and few) opportunities for uninterrupted time with your spouse on the big day — so make it count! 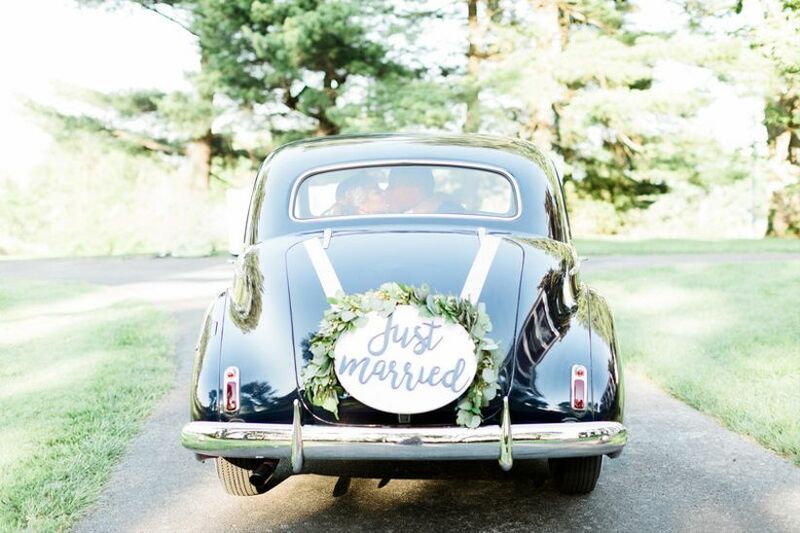 Traditionally, it's the responsibility of the wedding party (specifically the groomsmen) to decorate the getaway car, but you can consider leaving it up to your wedding planner, a style-conscious friend, or even handling it yourself. 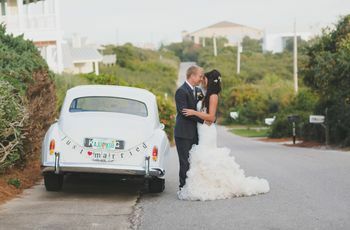 Keep in mind that if you're renting a car, you'll need to get permission from your wedding transportation vendor before adding any embellishments. Now, get ready for that "Just Married" photo op! 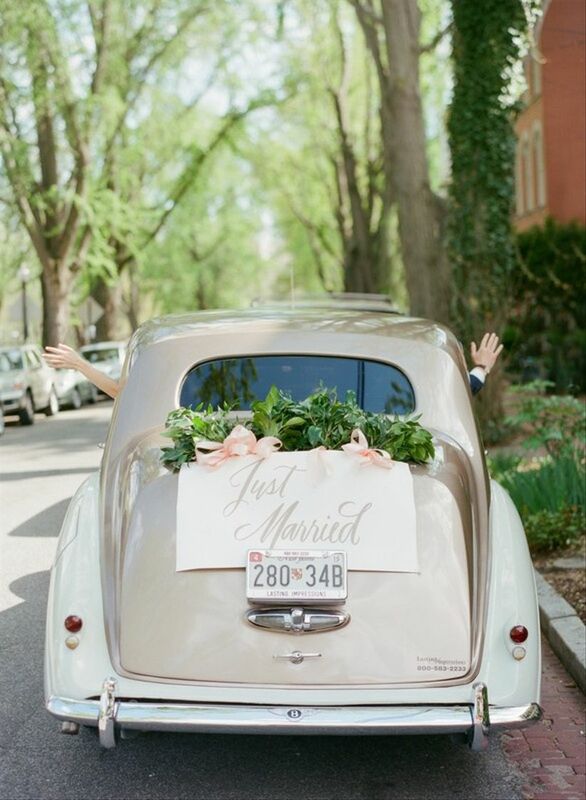 Here are 11 wedding car decoration ideas we love. Drape a greenery garland across the trunk of the car and finish the decoration by adding a cluster of flowers at each end. The finished result is classic with a twist. A cranberry red sign pops against an antique white car. When paired with gold calligraphy and a floral swag to match, this idea is totally elegant-meets-trendy. 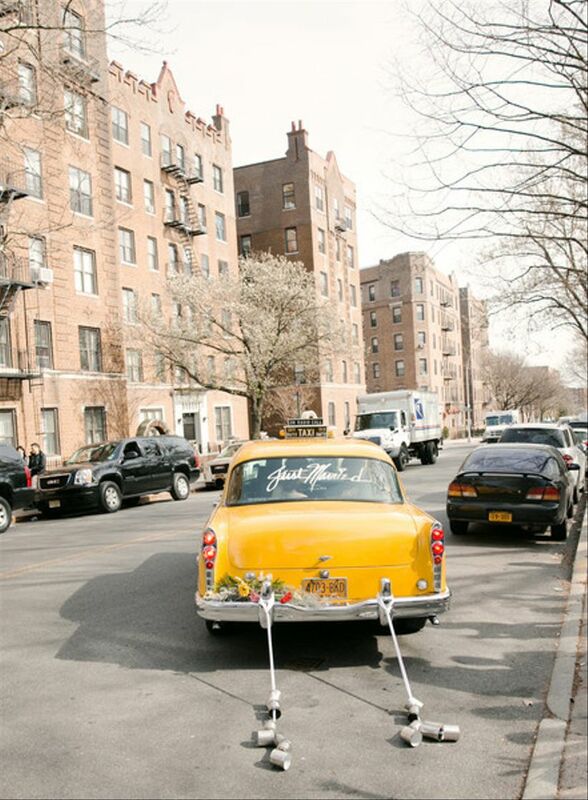 We can't resist this classic wedding car decoration idea, and if you're a stickler for tradition, you'll probably agree! 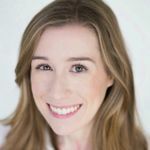 Tin cans are an iconic wedding detail — when else in life can you roll through the streets with them trailing behind you, catching everyone's attention? Tying the cans onto your bumper might seem like a no-brainer, but they run the risk of looking sloppy if you don't take the time to plan everything out (seriously). This should go without saying, but be sure to use empty cans only! Then, remove any labels from the cans, and attach them using durable string or rope that won't snap after a few minutes of driving. 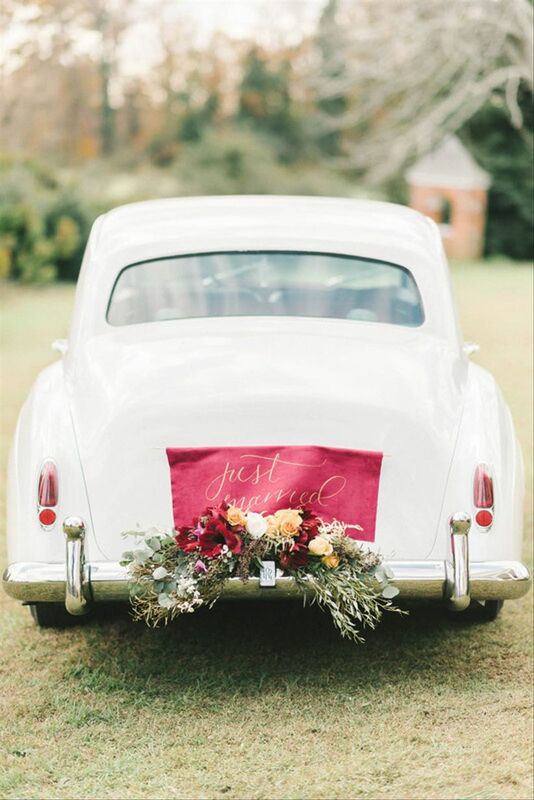 A gold laser-cut sign is a versatile option for practically any type of car or wedding style. 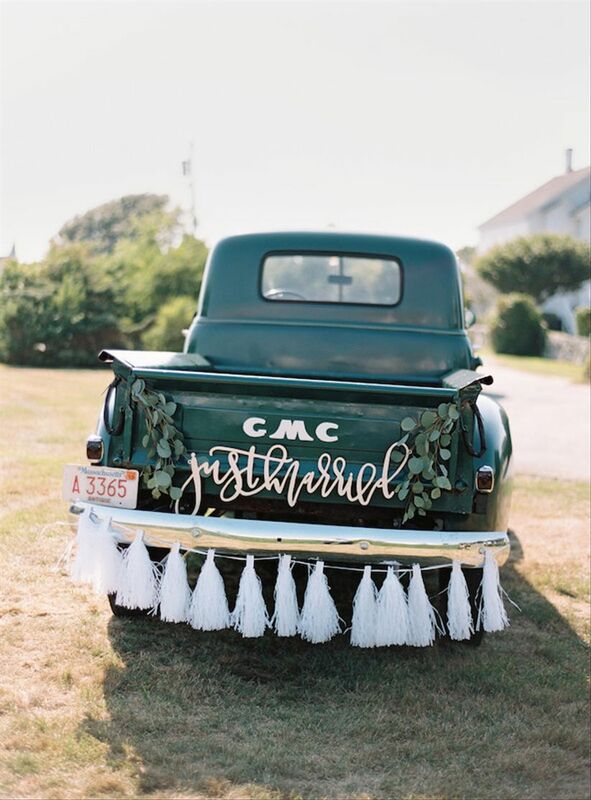 Pair the sign with eucalyptus garlands, oversized tassels, and a vintage pickup truck for a rustic chic vibe. 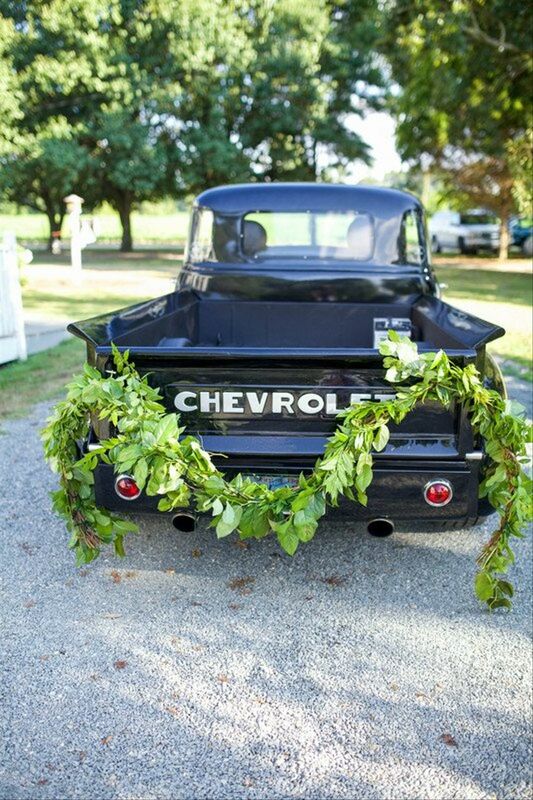 A floral wreath is a timeless and chic wedding car decoration. Dress it up with ribbons for extra pizzazz, or display the wreath on its own for a more subtle effect (it will look just as lovely!). 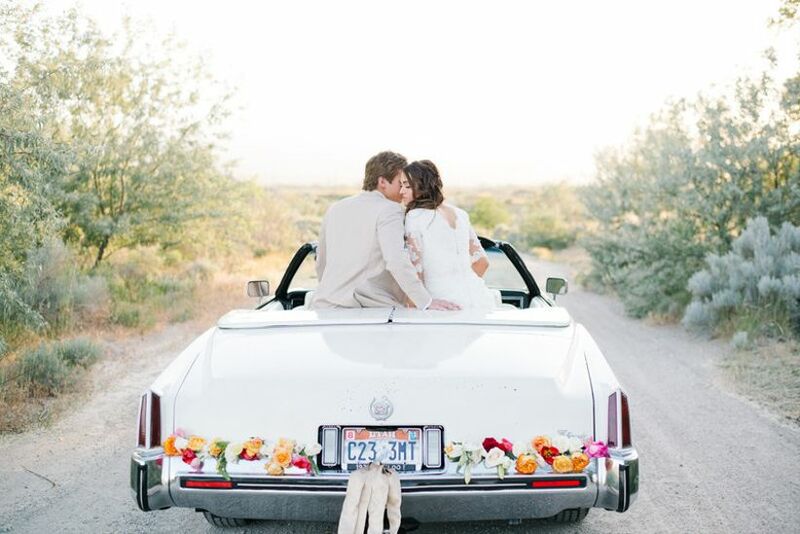 For the playful couple, bright flowers and long, trailing ribbons add a whimsical effect to any getaway car. Think about which colors would coordinate best with the car's paint color, like these cheerful yellow and pink roses against a white convertible. 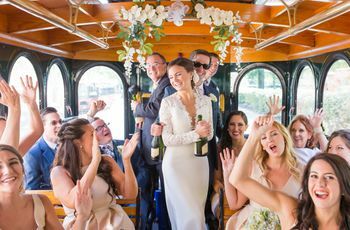 If you're transporting your entire wedding party, you'll likely need a larger vehicle, like a private shuttle or school bus. 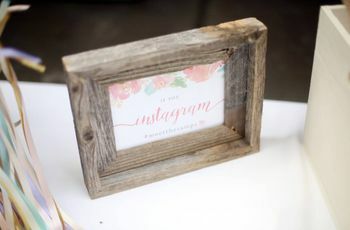 Use that extra space to decorate the side with your wedding hashtag! 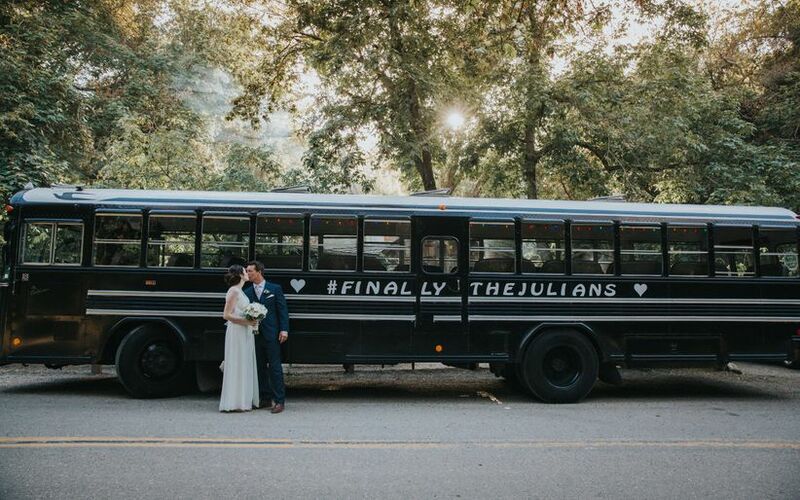 Thanks to family connections, this couple had their hashtag painted onto the side of the bus, but custom signage is a great temporary option that is easily removed after your wedding day. This romantic combo has us seeing hearts. Pair a "Just Married" calligraphy sign with blush pink bows and greenery bunches to achieve this vintage-inspired look. 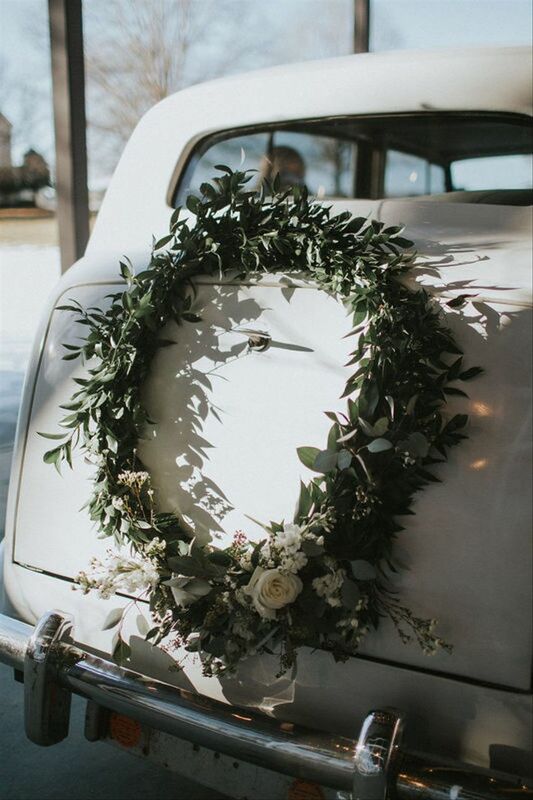 Whether your wedding style is rustic, bohemian, or classic, this no-fuss greenery garland is an effortless addition to your getaway car. Your wedding florist can provide tips on how to fasten the garland properly so it stays in place. Use letter balloons to spell out a fun message on the car's back bumper! In addition to "Cheers," some celebratory options include "I do," your initials, or even the wedding date. If minimal details are more your speed, there's need to go overboard! 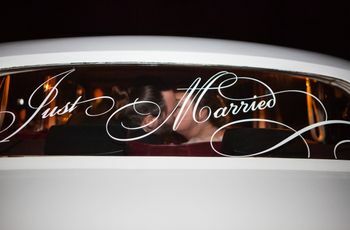 A basic "Just Married" sticker is a stylish wedding car decoration idea that gets the point across but also keeps things simple.